Geeta Kapur is India's foremost art critic, historian and curator; throughout the latter decades of the twentieth century, she has both shaped and documented the emergence of a contemporary art scene in the subcontinent. 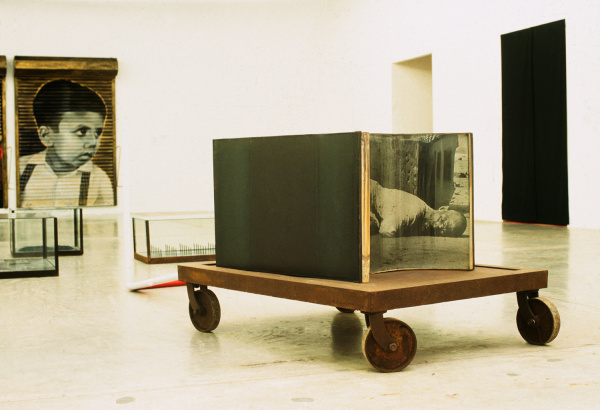 Her essays on art, film, cultural theory in the context of Third World perspectives and avant garde artistic practices have been widely anthologised – her 1989 essay 'Contemporary Cultural Practice: Some Polemical Categories' features in the recent Exhibition Histories title, Making Art Global (Part 1). Kapur has curated shows both nationally and internationally, as well as lecturing worldwide in university and museum contexts. In January 2010, the Asia Art Archive began to digitise the entire and expansive personal archives of Kapur and her artist-husband Vivan Sundaram, which includes thousands of photographs, artworks, slides, articles, clippings, catalogues and exhibition ephemera – arguably one of the most arcane and unique perspectives on South East Asian art ever to be collected online. There is perhaps no one better to comment on India's trajectory as a nascent ground for contemporary artistic and curatorial discourse; in the candid interview below, curator and critic Natasha Ginwala interrogates Kapur on the development of curatorial and discursive frameworks within the Indian art establishment. Natasha Ginwala: What are the possible reasons for a lack of institutional as well as extra-institutional discourse on curatorial practice in India thus far? Geeta Kapur: Any discourse on curatorship would be located and developed within two kinds of spaces: the museum (along with public galleries and independent exhibition venues), and the academy (art history departments and art schools with ancillary or full-fledged courses in curating). Since our institutional infrastructure is entirely underdeveloped – our museum structures are weak and art history departments in India are likewise impoverished – where could curatorial studies, or curatorial experiments have been nurtured? But I would like to elaborate on our institutional scene in a more particularised way and suggest that there is some preparatory discourse available, which can be tapped for use in future curatorial projects. Since the 1960s there has been a sustained pedagogic understanding of modern and contemporary art at the Fine Arts Faculty in Maharaja Sayajirao University, Baroda (and a somewhat later pedagogical renewal at Kala Bhavana, Santiniketan). The former began to alter the course of conventional art history by developing the field of visual culture wherein, potentially, the question of publics would have to be raised and, thereby, the question of curating – as an expositional activity in the public domain. This agenda, in a more complex configuration of disciplines and curricula, is now being fulfilled by the School of Art and Aesthetics at Jawaharlal Nehru University, Delhi. Simultaneous to the opening up of contemporary art to the broader discursive frame of visual studies, there was a widening of the aesthetic experience as well. Artists began to travel extensively to international workshops and exhibition sites, art historians and critics began participating in international conferences where, besides expanded theory, questions of creative and critical curating were gaining prominence. Opportunities started emerging in the 1990s for Indian critic-curators to show Indian art internationally; the entry of foreign curators interested in exhibiting contemporary Indian art in their own contexts changed the scene further. They brought in transcultural criteria which had indirect impact on concepts and language of the younger artists, which in turn made private galleries in India start up a process of self-learning. Slowly, Indian galleries are entering the international circuit – first through auctions, now in art fairs and potentially through exhibitory collaborations. NG: What are the reasons for the lack of curatorial interventions in the museum context? GK: We have one National Gallery of Modern Art with two branches and no independently-run regional or state or city museums to speak of. India has a conspicuously backward infrastructure for almost all museums in the country. Many state institutions dealing with the arts are run by bureaucrats with no background in art history, contemporary criticism or curatorial experience. Even when this is not the case, the state museums are run in the manner of government departments, with control over resources and policies. It is exceedingly difficult to create new posts, train existing staff or take on adventurous public programming. The museums have no significant cadre of curators, so where is the question of curating! We must of course keep in mind that while museum curating has a long and honourable history in the West, it was only in the 1960s that independent curation became a viable proposition, and major figures like Harald Szeemann emerged to reveal the potential of experimental curating in international exhibitions and public (/private) galleries. This corresponded closely to avant-garde art of the 1960s and 70s. That is to say, contemporary art and curation – mediated by engaged criticism – began to articulate common concerns. In India, for lack of museum and gallery initiatives in the public domain, there have been other, more informal, entrants into the exhibitory field. Artist-run organisations like KHOJ (and its more recent alliance partners in Mumbai, Calcutta, Guwahati and Bangalore) have expanded their reach from international workshops to cutting-edge expositions to creative programming, all based on radical curatorial ideas. Overseas agencies such as Max Mueller Bhavan, and more recently Pro Helvetia in Switzerland, are attempting to support programmes that advance curation; and gallery-foundations like FICA (Foundation for Indian Contemporary Art), are keen to host curatorial discourse and experimental opportunities. Now a funding agency like IFA (India Foundation for the Arts) has set up a substantial programme to examine and promote ideas and training in curation. Suddenly there is this hectic interest in curating. There are symposia and workshops and apprenticeship opportunities in India and there are, of course, degree courses and scholarships available overseas. Students could even sidestep the academic pursuit of art history and criticism to join these – not surprising, as curating is both more glamorous and, in livelihood terms, more sustaining. If they choose to work in India, young curators will need to use the opportunities provided by the private sector as there is, after all, no corresponding growth in state-run or public museums and galleries. NG: How does the emergence of the collector as the institution-maker impact upon contemporary curating in India? In your opinion, will the rise in private museums truly produce a more publically engaged creative sphere? GK: Private collectors are making a bid to fill the gaps in the impoverished art-infrastructure by building museums, residency spaces and inviting independent curators to work with their collections. The Jehangir Nicholson Collection in Mumbai is now housed in the (former) Prince of Wales Museum with young professional curators in charge. The Devi Art Foundation in New Delhi has greatly helped to energise curatorial activity and discourse in India. More recently the Kiran Nadar Museum of Art has come into the picture wanting to develop a museum culture in Delhi. And the K MoMA (Kolkata Museum of Modern Art) in Kolkata is positioning itself in the Indian art scene with the promise of a public-private collaboration. But of course wealthy collectors will have different motives when buying and displaying art, and these could range from the assertion of status to a gratification of personal ‘taste’ to social commitment. If collectors make a bid to institute a museum or even a public gallery, they will need to learn all the professional technicalities and protocol. Several museums across the world, including the MoMA, New York, have had private beginnings. Major museums in Central and South America were established through initiatives taken by a wealthy, nationally-committed bourgeoisie, or, indeed by artists, such as in Mexico, the Tamayo Museum(s), for example. Such institutions can then be absorbed into a public sector system, whereby more democratic programming is designed and larger audiences are served. Collectors in India can draw crucial lessons from these alternative museum histories. NG: There has been an increasing tendency to draw parallels between the contemporary art scene in China and India by art experts from the West but also some closer to home. It would be of immense value if you could put the matter in perspective – are there any genuine shared concerns and how do the two nations compare in relation to creative infrastructure? GK: The Chinese are pushing ahead their infrastructural developments with breathtaking ambition. The state is determined to promote Chinese art so that it becomes a frontrunner in the international arena; they are building academies with technologically equipped studios, museum and exhibition venues. They invite experts from all over the world, offering bold creative assignments. State control of the political sphere and state capitalism that can ride globalism – this is a strategy and a lure, and the more powerful for that. And while there may be dissension and censorship at the ground level, Chinese artists know how to fly high and make pragmatic adjustments within the system – so long as it serves their artistic fabulations. Even, maybe, so long as they can contribute, with a degree of cynical patriotism, to China's gaining distinction as a global player in all things, including contemporary art. Does that sound like the Indian situation?! Economy and politics, democracy and citizen’s rights, cultural policy, pedagogy and futuristic visions – the two countries are on an altogether different ticket. In some matters, to their advantage; in others, to ours. All comparisons between them ring false. Making abstract comparisons based on artists’ stardom, art markets spun by expatriates and the scale of international exposure is a result of the kind of glibness competitive globalisation promotes. That said – I would like to mention a project that seeks to encourage closer intellectual and artistic dialogue between contemporary philosophers, historians and artists from India and China. Partially coinciding with the eighth Shanghai Biennale in late 2010, an exhibition featuring Indian and Chinese artists, titled Place.Time.Play: Contemporary Art from the West Heavens to the Middle Kingdom. Johnson Chang was the project commissioner and Chaitanya Sambrani, the exhibition curator; Place.Time.Play is part of a larger project initiated by Chang (with the cooperation of Gao Shiming). The exhibition was preceded by a long preparatory phase and by a programme studded with talks and seminars that lay a discursive ground of exchange. This poetics of reversed geographies, and remembered temporalities between India and China provides the initial concept and assumes a lot besides: the actual traversal by participating artists of each others’ countries will yield a map of ‘situational’ concerns, time loops, cultural imaginings and reciprocal aesthetics – all of which seeks to break the glibly conflated futures of these two nations within global rhetoric. NG: Are there any other countries you would suggest we could look at in order to develop a clearer understanding of contemporary art cultures from a non-Western perspective? GK: It would be more interesting to shift our gaze towards national cultures of Central and South America, such as Mexico and Cuba and Brazil. They ‘belonged’ within the ‘Third World’, developed a cultural ethos on that basis, yet (given the tortuous history of encounter between European and indigenous cultures), nurtured a highly complex discourse on modernity – by developing distinct allegories, metaphors and models of the subject-in-history. Though our history is entirely different, our debates on identity, ethnicity and modernism produce an equally complex historical discourse; in addition to which, the narratives coincide over conditions of dire poverty, liberation struggles, social heterogeneity. I also find this to be the right time to look towards contemporary art and culture in West Asia – Iran, Turkey, Egypt, Lebanon – since these societies are struggling with their own contemporaneity under a double stress: civilisational dilemmas and the global economy that lures, exploits and mercilessly violates their integrity in the name of capitalist democracy. To me it seems more apt to engage with the art situation in Palestine, Beirut and Istanbul, rather than looking towards Beijing and Seoul. NG: How do you view the use of the lens of popular culture in exhibition-making and the study of contemporary creative processes? GK: I’m critical… but I must quickly add that this is a personal predilection. Many of my academic colleagues, whom I greatly respect, have chosen to re-frame the field of art history through the lens of popular visual culture. This is an intentional pedagogic turn made by scholars in the art history department of the Faculty of Fine Arts, Baroda and in the School of Arts and Aesthetics, JNU. I myself work within the frame of what used to be called high (/modernist) art in conjunction with avant-garde art, also sometimes called ‘critical’ or cutting-edge art. Rather than expanding the art-historical frame to include all sign systems that constitute visual culture, I want to engage with the semiotics of art in a way that its criticality is foregrounded, and thus its contingent/consequent politics. NG: Since you have mentioned the subject of critical art language, I would like to understand your distinctive usage of the term 'avant-garde' and what it meant to speak from the ‘Third World’ position. GK: In India I am almost alone in my insistent use of the term 'avant-garde' and I always have to explain! I use the term because I wish to distinguish it from modernist art; and because I want to both historicise the original movement in twentieth century art history (to the 1920s) and consciously extend it (to the 1960s-70s) when it splits and diversifies. But for me the stakes are actually different, and greater. I finally want to extend the term so much further as to transform its usage on fresh ground in the way its been done in Central and South America, now Asia: from Mexico to Brazil to Cuba – to China. I believe the concept of the avant-garde places a wedge in the morphological/formalist readings of art language, allows an alteration of prevalent equations, promotes alterity in actual practice. It also serves to break the misleading continuity between modernism and postmodernism in mainstream art history by cutting right through both categories. I was more pugnacious when the category of the ‘Third World’ was still operative. I am speaking about the 1950s through the 70s when de-colonisation/liberation movements were sweeping across many parts of the world and artists in the Americas, in Africa and (less vigorously) in Asia, and were proclaiming this third formation as the one that would dialectically mediate and transcend the impasse of the First and Second worlds (broadly the capitalist West and the socialist bloc). This phase in twentieth century is now periodised – politically and therefore also discursively. The term in use since the 1980s is postcolonial, and it very quickly developed an academic status that came in time to be (almost excessively) theorised. Just as postcolonial discourse overtook the Third World rhetoric, globalism has overtaken the postcolonial prerogative. My book, When Was Modernism deploys different terms of reference, from Third World to postcolonial to globalisation, yet belongs firmly within a nameable ideological mind-set. In a globalised world, terms such as transnational and transcultural have greater purchase, but let me add: there is little that is contestatory about ‘trans’ – it covers gaps and differences, thereby creating an illusion of a continuity-in-difference... The point to reiterate is that discourse is now so mobile as to be slippery and that one must learn to enunciate both firmly and flexibly in order to be heard. Vrischik Journal: The Social Context of Contemporary Indian Art, Year 4, No. 4, December 1972, Baroda. Courtesy Geeta Kapur/AAA NG: In the past decades, artists and critics ran cultural journals such as Vrishchik or Journal of Arts & Ideas, which appear to have been progressively replaced by ‘market-friendly’ art magazines. How does this trend impact cultural criticism and curatorial discourse? NG: While performing the role of critic-curator, you seem to create an epistemological bridge – with your writing often feeding your curatorial practice. Further, your texts have become a crucial component of modern Indian art history; how do you view this synergetic complementarity between writing and exhibition-making? GK: Though I pursued graduate courses in modern art history, cultural criticism and art writing, I simply call myself an art critic. Art historian would not be strictly correct and I hesitate (from due modesty!) to wear the badge of a cultural theorist though much of my writing is included in international cultural studies/cultural theory journals and anthologies. I believe I write on the aesthetic of modern and contemporary art, but theoretically, critically, politically, and that defines my professional profile. Though I started making exhibitions on a fairly large scale quite early on, the ‘title’ of curator came somewhat later and I hold it in partial abeyance in deference to the relatively small number of shows I have curated in these decades. Many art professionals actually prefer to name themselves as curators first, since they undertake criticism as part of their curatorial studies, and sometimes because it is more expedient to be a curator in today’s art world. Whenever I have been involved in exhibition making, the actual display, the phenomenology of the exhibition space, the dialogue between objects, the unexpectedness of the encounter and the meanings that surface in the setting up of an itinerary, thrills me quite separately from the conceptual paradigm of the exhibition. Yet, criticism forms the foundation of my curation; it shapes the concept and design of the exhibition, so I conscientiously maintain the difference: it is my discursive and critical formation that is primary, therefore I am critic first, then curator. This interview was first published in Art & Deal magazine (Issue 32) and has been revised for Afterall Online. Geeta Kapur and Vivan Sundaram's personal archive has been digitised by Asia Art Archive's recently launched project 'Another Life: The Digitized Personal Archive of Geeta Kapur and Vivan Sundaram'. More images, texts and information on Kapur and Sundaram's careers will soon be available for free online access here. For several decades now, Geeta Kapur has both shaped and documented India's contemporary art scene. In the second part of this interview, Kapur discusses nationhood, identity and the problematics of globalised curation, with Natasha Ginwala. Nicole Wolf surveys the latest edition of Experimenta in Bangalore, the Indian festival of experimental cinema, with this year a special focus on film and video work from Asia. The second book in Afterall’s Exhibition Histories series focuses on the third edition of the Bienal de La Habana, which took place in 1989, and interrogates the ways in which this exhibition extended the global territory of contemporary art and redefined the biennial model.